There was once again a repeat of kidnapping, involving wealthy Haitians, mostly those opposed to the tyrannical regime of Jean-Bertrand Aristide, in Haiti today. Lugi Leroy, 14, the daughter of Mr. Maelle Flambert and Mrs. Martho Flambert, was kidnapped Friday, as she was about to access a packed automobile, in front of the Port-au-Prince's prestigious Saint-Louis de Gonzague high school, her parents were waiting in to drive her home from school. The kidnappers thereafter demanded U.S. $600.000 for the little girl's freedom. The latest kidnapping came after the family of Lionel Gaderre last week paid a large ransom for his release, and Billy Lauture was murdered, also last week, because his family refused to adhere to the kidnappers' demand, that a large sum of money be paid if he is to regain his freedom. GONAIVES, Haiti, Feb. 13 (AFP) - Haitian rebels occupying several towns vowed Friday to resist any government operation against them as aid agencies stepped up warnings of a food and medical crisis. Rebels opposed to President Jean Bertrand Aristide who took over the northern city of Gonaives on February 5, and followed with other towns, insisted they could fight off any police attempt to retake the city. About 50 people have been killed already since the troubles started. "Any police operation will be pushed back because we have the means, the desire and the conviction to do so," Winter Etienne, a leader of the Revolutionary Artibonite Resistance Front told AFP. The political opposition that launched the campaign against Aristide has disowned the armed groups but Etienne said the rebels could "free" more cities, including the second city of Cap Haitien. Etienne said forces from the Organization of American States would be permitted to enter Gonaives, but no Haitian police. If US troops try to help Aristide, he warned, "we would take down the Haitian flag here and raise the Cuban flag." Another rebel leader, Butteur Metayer, called for insurrection nationwide and warned "we will not wait until the end of February to march into Port-au-Prince to topple Aristide." He claimed rebels hold several towns in Artibonite department including Anse Rouge and Marchand-Desslines. There was no independent confirmation. The International Committee of the Red Cross (ICRC) said medical facilities were grinding to a halt as staff feared for their safety and victims of violence were scared to visit hospitals. "The ICRC is particularly concerned about repeated cases of armed persons entering medical facilities," the agency said in a statement. "These incursions are posing a growing threat to medical staff and patients alike." UN aid agencies on Friday appealed for swift access to Gonaives, Cap Haitien and other northern towns which food convoys cannot reach because of the violence. "What humanitarian workers need now is access to the north," said Elisabeth Byrs, a spokeswoman for the UN humanitarian coordinator in Geneva. An aid flight arrived in Cap Haitien on Thursday, allowing 300 Cuban doctors in the region to keep working, she added. Byrs warned that a fuel shortage was affecting power supplies to hospitals and hampering supplies of clean drinking water. In Brussels, the European Commission expressed concern about the violence and said it was evaluating the need to send aid. "We are following the developments with great care," said Diego de Ojeda, foreign affairs spokesman for the European Union's executive body. "Clearly, the situation is very worrying." US Secretary of State Colin Powell said the United States, Canada and the 15-nation Caribbean Community would hold talks on the unrest Friday in Washington. In Port-au-Prince, Haiti's communications minister condemned violence by armed government supporters who erected barricades of burning tires and rocks Thursday to quash an opposition rally. "The government condemns these actions, which we do not agree with, and police are proceeding with arrests," Mario Dupuy said. The opposition called off its planned demonstration Thursday, saying it feared for supporters' lives. A new demonstration has been called for Sunday. PORT-AU-PRINCE, Haiti, Feb. 12 - After blocking a march route with flaming barricades, supporters of President Jean-Bertrand Aristide threw stones at opposition demonstrators Thursday, forcing them to cancel a mass protest. The clash came a day after Aristide vowed to stay in office, despite international criticism and calls for his resignation by a bloody revolt that has spread to dozen towns and cities and left 49 dead. "We don't want confrontation," opposition coalition spokesman Mischa Gaillard said on independent Radio Metropole. "The police have not done their duty to serve and protect. Since our strategy is a peaceful one ... we have cancelled the demonstration." Critics including the U.S. government have accused Aristide of blocking similar demonstrations and, despite his protestations against violence, inciting police and his supporters to attack opponents. Aristide has blamed the opposition for the recent bloodshed, accusing it of sponsoring a former criminal gang and ex-soldiers of the disbanded Haitian army in their deadly revolt moving through western coastal towns along the Caribbean Sea. "They suffer from a small group of thugs ... acting on behalf of the opposition," Aristide said Wednesday at his first news conference since gun battles between rebels and police erupted Feb. 5. Aristide's opponents have distanced themselves from the fighting, although they  like the insurgents  want to oust the president. "Our movement is a nonviolent movement," Apaid said Thursday. The president repeated his determination to remain in office until his term ends in 2006. He did not address how he planned to put down the insurrection. His officials have said that, to prevent civilian casualties, any counterattacks must be part of a strategy that could take time to plan. But the rebels who launched the revolt say they were armed by Aristide's party to terrorize his opponents in Gonaives, Haiti's fourth-largest city, which remained in rebel hands Thursday. Winter Etienne, a leader of the rebel Gonaives Resistance Front, said Wednesday they were taking their battle to other cities. "We already have a force hiding in St. Marc, and we also have one hiding in Cap-Haitien. They are awaiting the orders to attack," Etienne told The Associated Press, referring to towns on the western coast. But it appeared police backed by pro-Aristide gunmen have reinforced their control in St. Marc, a key port city 45 miles west of the capital. 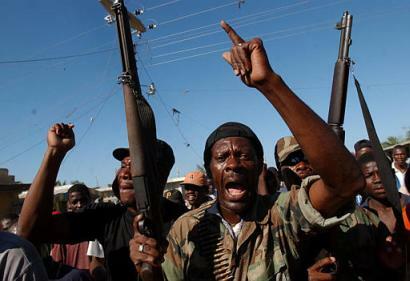 In an indication most rebels had fled the city, insurgent leader Charles Nord Thompson on Thursday told RadioVision 2000 that he could account for only 10 of some 100 men who had seized the city Saturday. On Wednesday, witnesses said, police entered the St. Marc slum stronghold where rebels were holed up, shooting to provide cover for Aristide militants who then set five houses ablaze and fired at fleeing residents. Reporters saw the charred remains of one of two people witnesses said burned to death, and the bodies of three people apparently shot in the back. Rebels perpetrated similar reprisals Wednesday in Gonaives, burning to death a man accused of being an Aristide hitman in the "necklacing" style: putting a tire over his head, dousing him with gasoline and setting him aflame. It's a form of killing that Aristide once encouraged during the popular uprising that led to the downfall of the 29-year Duvalier family dictatorship in 1989 and his rise to power. Haiti has suffered more than 30 coups in 200 years of independence, the last in 1991, when Aristide was ousted just months after his election as the Caribbean nation's first freely elected leader. President Clinton (news - web sites) sent 20,000 U.S. troops in 1994 to end a military dictatorship, restore Aristide and halt an exodus of Haitian boat people. U.S. officials say they now are on alert against any new exodus set off by the uprising. "We are extremely concerned about the wave of violence spreading through Haiti," White House press secretary Scott McClellan said Wednesday. "We call on the government to respect the rights, especially human rights, of the citizens." Aristide's popularity has waned since his party swept flawed 2000 legislative elections. International donors have frozen millions of aid dollars, and the president has been unable to keep his election promise of "peace of mind, peace in the belly." In Haiti's second-largest city, the northern port of Cap-Haitien, Aristide militants manned fiery barricades to block any rebel incursion and fired shots through the night. The house of a reporter for Radio Maxima, the voice of the opposition in Cap-Haitien, was burned, witnesses said. Radio Maxima was shut down Dec. 17 by police who smashed and shot up equipment. In Haiti's sprawling slums the poor still hail him as Aristide Wa, Aristide the king, in Creole. President Jean-Bertrand Aristide remains Haiti's most popular politician, by a country mile. Yet he's an imperious, divisive figure who currently rules by decree and who is loath to share power with his conservative rivals. His re-election in 2000 was tainted. And now he's reaping the whirlwind he sowed. Having promised "peace of mind, peace in the belly" during the 2000 campaign, Aristide has presided over growing disorder, keener hunger and swelling public disaffection. Haiti is marking its 200th anniversary as the world's first black state with a spasm of violence that has left scores dead. Cap-Haitien and a half-dozen other cities have been convulsed by fighting between Aristide's small police force and opposition gunmen, and by a wave of murder, arson and looting. Meanwhile in Port-au-Prince, the capital, the opposition Democratic Convergence plans to strut its stuff today in a mass protest to force Aristide out before his term ends in 2006. The opposition includes civic leaders, some trade unions, business leaders, intellectuals and some clergy. Insufficiently popular or united enough to win an election, they nonetheless are strong enough to create havoc. Haiti's key cities are in a panic as Aristide's police and his Lavalas party enforcers fight pitched battles with disaffected Aristide loyalists, criminal gangs and thugs who once served the despot Francois Duvalier and his son, and who now claim to be part of the political opposition. Both sides have recruited thugs and criminals to intimidate the media, and each other. This growing chaos has diminished Aristide's stature. But no figure has arisen to rival his popularity with the poor who make up the great majority. Aristide is a populist, left-leaning former priest and fiery orator who quit the clergy to hold public office, and who legalized voodoo as a religion. He became Haiti's first elected president in 1990 after courageously defying the Duvalier family and the military. Deposed in a 1991 coup, Aristide was reinstated in 1994 by Bill Clinton. And he won a second term in 2000 in elections the opposition refused to contest. Haiti's elite, the 1 per cent who control half the nation's meagre wealth, has never accepted Aristide. But many of Haiti's 8 million poor, who scrape by on $2 a day, still regard him as their hero. And if Aristide were ousted, his foes would soon be at each others' throats. That's why Prime Minister Paul Martin's government has been urging "calm and full respect for the rule of law" rather than a shambolic change of regime. Canada has invested $535 million in Haiti over three decades, and sent Mounties and experts to train Aristide's judiciary, police and civil service. While that traffic in Canadian values has helped fuel the demand for reform that is occurring today, anarchy is not the way forward. Already, the political impasse has prompted donors to put $500 million in aid on hold, hobbling the weak $3.5 billion economy. Haitians remain proud of their history of revolt against Napoleon and slavery, and their establishment of the first black republic in 1804. But today they are the poorest people in the Western Hemisphere, struggling with disastrous soil, forest and water erosion. It is a tragedy that Aristide, the courageous reformer, has been falling back on the same thuggish force and fear that Haiti's former despots employed. This violence serves notice that Haiti will need more than a few short years to rid itself of a predatory political culture that encourages a small political elite to chase power, privilege and wealth by winning public office, and to hang on by rewarding cronies. If Aristide hopes to survive this crisis, he should agree to share more power by appointing a new prime minister who commands the confidence of opposition groups. He ought to head a broad coalition, not the biggest gang. He must rein in his armed supporters and hold internationally supervised elections. This time, the opposition should contest them. Most importantly, a line must be drawn against anarchy. Aristide was elected by all Haitians. His forced removal by armed foes would be a tragic step backward. PORT-AU-PRINCE, Feb. 11 (AFP) - Haiti's political unrest claimed three more lives as the country's second-largest city remained without power amid outbreaks of sporadic looting. The victims, three young people, were shot dead in the Haitian city of Saint Marc, 96 kilometers (60 miles) north of the capital Port-au-Prince, according to an AFP correspondent. The latest blood letting raised the death toll in the striken Caribbean republic since last Thursday to at least 46 following the deaths of two people in Saint Marc overnight. The three corpses Wednesday were seen sprawled on the ground in a neighborhood of this small port city, plagued by armed clashes between police rebels opposed to President Jean Bertrand Aristide. The northern city of Cap-Haitien, the country's second biggest, was also without power after a food depot was looted and torched, amid increasing fears that groups supporting Aristide would retaliate if rebels tried to take over the city. UN Secretary General Kofi Annan said he would send a UN team to the striken Caribbean republic to assess its humanitarian situation. Tensions spilled over in several other towns as the Aristide government struggled to win back control of towns taken by armed rebels. The United States voiced worry over Haiti's mounting troubles. "We are extremely concerned about the wave of violence sweeping through Haiti, and we certainly deeply regret the loss of life," White House spokesman Scott McClellan told reporters. Defense Secretary Donald Rumsfeld has said the United States had no plans to send US troops to restore order in Haiti. In 1994, Washington sent 20,000 troops to Haiti to bring Aristide back to power after he was sacked in a coup. He stepped down after a five-year term and was re-elected in 2000. Aside from the food depot in Cap-Haitien, other businesses were destroyed or vandalised in the tense atmosphere on Wednesday, a local journalist told AFP. Many lottery stands and restaurants owned by people believed to oppose Aristide have been burned down in recent days. "We call on the government to respect the rights, especially human rights, of the citizens and residents of Haiti," McClellan said. Two people accused of being members of the opposition were burned alive in their homes overnight in Saint Marc, according to a local journalist. The killings were apparently in retaliation for the torching of a clinic run by a doctor whose brother is in the pro-Aristide camp, according to the journalist. Saint Marc is one of three cities police took back on Monday from rebels who have claimed control of a dozen towns since last Thursday. Shots were heard in a Saint Marc neighborhood controlled by Ramicos, an armed opposition group. Several police stations have been destroyed since opponents of Aristide stepped up their protests. The main police station in Limbe, just south of Cap-Haitien, was abandoned on Monday night before it was burned down by an armed group, a journalist said. Rebels calling themselves the National Reconstruction and Liberation Front said they were determined to liberate the whole country. "The Haitian revolution is on the march," rebel spokesman Winter Etienne said in a statement. "We have decided to no longer live in despair. We will regain our hope for the future." In New York, Kofi Annan's spokesman said the UN chief had decided to send a team to Haiti. He said Annan is unlikely to send a special envoy to the country, preferring for now to focus on regional efforts to end the showdown between armed rebels and Aristide's supporters. Aristide, who has vowed to stay in office until his term ends in 2006, has been ruling by decree after failed elections last year left Haiti without a functioning legislature. The populist priest-turned-president has promised elections within six months but has not set a date. Aristide has accused the opposition political groups of favoring a coup d'etat against him, but opposition parties distanced themselves from the armed opposition. "We distinguish the popular movement we support, demanding the departure of Jean Bertrand Aristide, from armed rebels with whom we do not identify ourselves," socialist Micha Gaillard, a prominent opposition political figure, told AFP. International calls for peace continued. France called for an "immediate end to violence." The United Nations warned that Haiti faced a "major humanitarian crisis," and the United States and Canada advised their citizens to leave the country. The Organization of American States and the 15-nation Caribbean Community have been trying to find a peaceful solution to the crisis. WASHINGTON, Feb. 11 (AFP) - The United States is "extremely concerned" about violence in Haiti and calls on the struggling government there to respect human rights, White House spokesman Scott McClellan said. "We are extremely concerned about the wave of violence sweeping through Haiti, and we certainly deeply regret the loss of life," the spokesman told reporters. "We call on the government to respect the rights, especially human rights of the citizens and residents of Haiti," he said, a day after the US State Department urged Americans to leave Haiti "if they can so so safely." McClellan also downplayed the chances of US military intervention, stressing that Washington supports a diplomatic mediation effort through the Organization of American States (OAS) and the 15-nation Caribbean Community (Caricom). "We'll continue to support the efforts of the caribbean community as well as organization of american states to help bring about a peaceful resolution," he said. Defense Secretary Donald Rumsfeld told reporters Tuesday that the United States has not considered sending troops to Haiti, which has been crippled by mounting violence aimed at challenging President Jean-Bertrand Aristide's rule. "Everyone's hopeful that the situation which tends to ebb and flow down there, will stay below a certain threshold and ... we have no plans to do anything," Rumsfeld said. Former president Bill Clinton sent 20,000 troops in 1994 to return Aristide to power, three years after he was overthrown in a bloody military coup. The populist priest turned president has promised polls within six months but has not set a date. PORT-AU-PRINCE, Feb. 11 (AFP) - Haiti's second city remained without power after a food depot was looted and torched in the latest troubles to hit the stricken Caribbean republic, reporters said. Tensions spilled over in several towns Wednesday as the government of President Jean Bertrand Aristide struggled to win back control of towns taken over by armed rebels. The population of the northern city of Cap-Haitien, the country's second biggest, was without power amidst increasing fears that groups who support the president would retaliate if rebels tried to take over the city. A food storage depot was looted and burned down during the night and businesses were badly hit by the tense atmosphere on Wednesday, a local journalist told AFP. The main police station in Limbe, just south of Cap-Haitien, was abandoned on Monday night before it was burned down by an armed group, the journalist said. Several police stations have been destroyed since opponents of Aristide stepped up their protests. Police took back three of the dozen cities taken since last Thursday but shots were heard again in St Marc after the city was retaken, a correspondent said. The shots were heard in a neighborhood controlled by Ramicos, an armed opposition group. WASHINGTON, Feb. 10 - The U.S. Coast Guard is monitoring waters off Haiti for signs that the number of Haitians trying to flee will increase due to the violence wracking the country, a State Department official said Tuesday. No increase has been detected thus far, but U.S. authorities are watching the situation closely, said the official, who asked not to be identified. In 1992, tens of thousands of Haitians tried to escape a repressive military government then in power. Many were picked up and taken to the U.S. naval base in Guantanamo Bay, Cuba. An increase in construction of homemade boats would be one sign of intent to flee, but that has not occurred, the official said. Between 2,500 and 3,500 fleeing Haitians are picked up by Coast Guard cutters each year and repatriated, the official said. There are no reliable estimates on the number of Haitians who arrive in the United States or perish at sea, the official said. Secretary of State Colin Powell (news - web sites) received the diplomatic credentials Tuesday of Haiti's new ambassador, Raymond Valcin. He told Valcin that Haiti should attempt to restore peace by seeking a political solution. The United States is keeping generally a low profile in Haiti, preferring to allow diplomats from the Caribbean and the Organization of American States to try to overcome the wide gap between President Jean-Bertrand Aristide and his opponents. In 1994, U.S. forces reinstated Aristide to power, forcing out a three-man junta that had deposed him in 1991. Now the administration seems to be holding Aristide responsible for the unrest, which has claimed more than 40 lives. "Our goal has been to make clear to President Aristide that he needs to take the opportunity to make peace, take the opportunity to reach a political settlement," State Department spokesman Richard Boucher said. Beyond that, he said Aristide must undertake "thoroughgoing reforms" if stability is to be achieved. The United States has asked Congress for $55 million in humanitarian assistance for Haiti this year. The aid total last year was $72 million. Part of the unrest stems from parliamentary elections in 2000 that many regarded as fraudulent. Haiti is one of 34 countries that belong to the Organization of American States, which insists on democratic governance as a requirement for membership. The State Department official said the department is trying to determine whether Haiti still qualifies as a member. WASHINGTON, Feb. 10 (AFP) - The international community must take a more active role in Haiti, where dozens have died in an armed insurrection, to prevent the crisis from becoming a tension blackspot, experts warned. Anti-government protests have spread in Haiti since mid-September, demanding the resignation of elected president Jean Bertrand Aristide. Armed rebels control much of the country's north, though the government has managed to wrest control of three cities from them. Jim Morrell, director of the Haitian Democracy Project in Washington, said the international community needed to help the democratic sector of Haitian civil society. "I'm very concerned that ... they'll be squeezed and eliminated, and then Haiti will be like a Sierra Leone or a Rwanda. You won't have anything left except the feuding gangs," he said. Washington's support for Haiti through the Organization of American States and Caribbean Community is not enough, he said. "When the US is hiding behind the OAS or the Caricom, it's because they are not making any kind of an effort to lead a policy. What the US has simply been doing is sticking with the incumbent who happens to be in the palace because that seems the easy way to stability, and the US has done this many times throughout Latin America," he added. US Secretary of State Colin Powell sought Aristide's commitment to quell the violence, during a meeting Tuesday with Ambassador Raymond Valcin, a spokesman said. "The secretary used that opportunity to press the ambassador -- and through him the Haitian government -- to accept the effort of Caricom and to seek a political solution to the troubles in Haiti," spokesman Richard Boucher said. "We think it's vital that the government takes steps to end the climate of violence that's been created by these gangs and to reach a political settlement to Haiti's troubles," he said. US Defense Secretary Donald Rumsfeld said Washington has no plans to intervene militarily in Haiti. The United States sent 20,000 troops to Haiti in 1994 to bring Aristide back to power after he was ousted in a coup. Aristide recently agreed with Caricom mediators not to seek re-election in 2006 and to form a new government soon with a prime minister acceptable to the opposition. But he has yet to set a date for promised elections and the opposition is not satisfied. The OAS since early 2002 has had a special mission aimed at strengthening democracy in Haiti. It has demanded however that any political change take place peacefully and democratically. "The Haitian government could more forcefully internationalize this issue," said Robert Maguire, a former State Department official and leading Haiti expert, now a professor at Trinity College. Because the government is calling the uprising an attempted coup, OAS declarations allow the group to take a greater role, Maguire said. "Part of the problem is that the opposition to Aristide has come to detest the OAS. They seem to believe that the OAS has cast its lot with the government, with its sworn enemy," Maguire said. The unarmed political opposition has distanced itself from the rebels. Aristide, who stepped down after a five-year term, was re-elected in 2000. 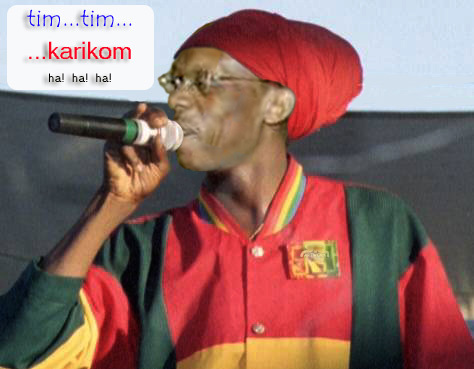 But the opposition was outraged when Aristide's party in 2000 won legislative elections that rivals insist were rigged. WASHINGTON, Feb. 10 (Reuters) - The United States said on Tuesday resolving the upheaval in Haiti would require major changes in the way the state is governed and a senior official said this could mean President Jean-Bertrand Aristide stepping down. "We recognize that reaching a political settlement will require some fairly thorough changes in the way Haiti is governed," State Department spokesman Richard Boucher told reporters at a regular briefing. "The actual, sort of, formulas and mechanisms for that would have to be worked out, we hope, through peaceful negotiation using the efforts of CARICOM (the Caribbean Community regional bloc)," he said. A senior State Department official said proposals for a resolution were under discussion which could involve Aristide's departure from office, although he did not specify who was making the proposals. "It's clear from the kind of proposals that have been made and the discussions that are being held that when we talk about undergoing change in the way Haiti is governed, I think that could indeed involve changes in Aristide's position," he said. Police are battling armed rebels for control of a number of towns across Haiti, the poorest nation in the Americas. The United States says the violence stems from Aristide's use of gangs of thugs for years to intimidate political opponents. Caribbean leaders, who have mediated between the opposition and Aristide, won acceptance earlier this month from the former Roman Catholic priest that he would set up a broad-based advisory council to the government, appoint a new prime minister and disarm gangs aligned with political parties. But with a surge in violence in the last week and little concrete follow-up from Aristide, Washington appeared to be increasing the pressure on the leader, who was restored to power by a U.S. invasion in 1994 after a coup. But since his election to a second term in 2000, Aristide has had a rocky relationship with the international community and Washington has blamed him for fomenting a climate of violence that led to this month's revolt. CAP-HAITIEN, Haiti, Feb. 10 - Militant followers of President Jean-Bertrand Aristide set up blazing barricades Tuesday to hold back a rebel uprising that has spread to eleven towns and killed at least 42 people. U.N. aid workers meanwhile warned of a looming food crisis. Gunfire crackled across Haiti's second-largest city of Cap-Haitien overnight, and Aristide partisans reportedly burned a restaurant and several lottery stalls owned by rebel supporters. Unidentified assailants lobbed rocks and bottles at passing vehicles. Officials said police helped by a pro-Aristide militia had managed to fight off rebels in shootouts in Dondon, 12 miles outside Cap-Haitien on Haiti's north coast. Aristide supporters torched houses of nine anti-government activists, Radio Vision 2000 reported. After sporadic gunbattles on Monday, police also regained control of the important port city of St. Marc, 45 miles west of Port-au-Prince, and nearby Grand-Goave. At least two men were shot in St. Marc and a third allegeldy was shot and killed by Aristide supporters. His headless body was left on a roadside. In Cap-Haitien, a city of half a million, men in dark glasses manned roadblocks built from overturned vehicles and burning tires set on piles of garbage. The barricades, some manned by Aristide supporters and others by rebels, were preventing food deliveries to tens of thousands of desperate Haitians, the U.N. World Food Program warned from Geneva. The blocks also were preventing deliveries of fuel and northern towns were expected to run out of diesel to power electricity generators by the end of Tuesday. Cars lined up at several gas stations in Cap-Haitien, some of which had already run dry while others were rationing. Remy Charlot, 44, said Aristide militants gutted his restaurant overnight. "Because I criticize the government that's why," he told The Associated Press. "They came inside. They poured gasoline on all my stuff and they burned it." Rebels have torched numerous police stations and government buildings and property belonging to Aristide officials since the uprising that began Thursday in Haiti's fourth-largest city of Gonaives. The revolt is a dangerous turning point in Haiti's three-year political crisis. A similar one in 1985, which also started in Gonaives, led to the end of the 29-year Duvalier family dictatorship. The Democratic Platform, an opposition coalition made up of political groups, civic leaders, clergy and students, distanced itself from the revolt on Monday though it shares the rebels aim of forcing Aristide to step down. "The national police alone cannot re-establish order," Prime Minister Yvon Neptune warned Monday in St. Marc. He said the violence was "tied to a coup d'etat." Haiti has suffered more than 30 coups since its independence in 1804. With no army and fewer than 5,000 poorly armed police, the government force has been outgunned and outnumbered. Numerous police stations have been torched because they symbolize Aristide's authority and officers are accused of siding with government supporters. Tension has mounted since Aristide's party won flawed legislative elections in 2000 and international donors blocked millions of dollars in aid. Misery has deepened with most of the nation's 8 million people living without jobs and on less than $1 day despite election promises from Aristide, a former priest who had vowed to bring dignity to the poor. The United States accused the government of inciting some of the violence. State Department spokesman Richard Boucher told reporters Monday that "bands of violent actors, thugs on both sides" are responsible "as well as the government reaction that we think has often sometimes contributed to the violence." U.N. Secretary-General Kofi Annan said the United Nations "will be stepping up our own involvement fairly soon" but did not elaborate. Bertrand Ramcharan, the acting U.N. High Commissioner for Human Rights in Geneva, deplored "the killings and destruction." Tolls put together from witnesses, Red Cross officials, rebel leaders and radio reports indicate at least 42 have died, including several policemen. The rebels include former Aristide supporters, former soldiers who helped oust Aristide in a 1991 coup and civilians frustrated by deepening poverty. Aristide won Haiti's first democratic election in 1990 and was ousted months later by the army. He was restored in a 1994 U.S. invasion, and disbanded the army three months later. PORT-AU-PRINCE, Feb. 9 (AFP) - Haitian authorities wrested control of a northern city away from rebels, who in less than a week have pushed through nine other towns in a violent drive to force President Jean Bertrand Aristide to step down. Rebels controlled the northern Artibonite province, whose main city, Gonaives, fell after a rebel attack on Thursday. About 40 people have died in the region since then, according to local journalists, residents, and hospitals. But police, assisted by helicopters, managed to reclaim control of Saint-Marc, located between Port-au-Prince and Gonaives, after battling rebels for several hours, according to police and city residents. Haitian Prime Minister Yvon Neptune, who has accused opposition groups of plotting to overthrow the government, visited Saint-Marc, a city of 160,000 located 96 kilometers (60 miles) north of the capital, after the police operation. Witnesses had reported hearing gunfire and seeing plumes of black smoke rising above burning barricades erected across the city, but the shooting had stopped by the end of the day. The Revolutionary Artibonite Resistance Front (RARF) have forced police out of Gonaives, a city of 200,000 where at least three police officers were killed in fighting Saturday. The rebels destroyed bridges and dug trenches to stop police from returning to Gonaives, according to radio stations. Television images Sunday showed corpses lying in the city's roads while men armed with guns, improvised maces and machettes stood on cars and roamed the streets. More than 60 people have died in Gonaives since the unrest began in September and more than 100 have been injured. Shootings, vandalism and looting erupted in several cities as police fought to quash the uprisings. Northern cities have run out of power and fuel. Police escaped from Dondon after residents there burned down the police station, according to a radio report. Ten police stations were abandoned Monday. Shots were fired overnight at the homes of opposition members in Cap-Haitien, the country's second largest city, but schools and businesses were able to open Monday, according to local media. "This violence is connected to a coup attempt," Neptune said Sunday in a television interview. Aristide, a former Roman Catholic priest, was last elected in 2000. He insisted that he will hold office until his term ends in 2006. "If the opposition wants to participate in the construction of a law-abiding state, it should play a role in stopping the violence," Neptune said. He called on the opposition to participate in helping the country hold elections, saying it was the only way out of the violence. Parliamentary elections failed last year when no electoral body was set up to oversee the polls, leaving the nation without a functioning legislature. Aristide now rules by decree, although he has promised elections within six months. The opposition dismissed his proposal as inadequate. Neptune asked Haitians to report attacks on police to allow authorities to restore peace in the impoverished nation. But US State Department spokesman Richard Boucher accused the Haitian government of contributing to the violence. "The government has responded with a combination of police and pro-Aristide gangs," he said, adding later, "We call on the government of Haiti to respect the rights, especially human rights, of all citizens and residents of Haiti." The United States sent 20,000 troops to Haiti in 1994 to bring Aristide back to power after he was sacked in a coup. He stepped down after a five-year term and was re-elected in 2000. Evans Paul, a leader of the political opposition, urged police not to fight the population, who he said shared the rebels' desire to force Aristide to step down. The Organization of American States, the United Nations and France called for an end to the violence. UN Secretary-General Kofi Annan announced that the UN would "very soon" increase its involvement in the troubled nation. US WASHINGTON, D.C., Feb 9 (OneWorld) -- A spreading and increasingly violent rebellion against Haitian President Jean-Bertrand Aristide is destabilizing the Caribbean nation in ways that could move it to the top of Washington's foreign-policy. U.S. officials are deeply concerned that the violence, if not quickly ended, may well spark a new exodus of thousands of Haitian boat people headed for the United States. Reported plans to interdict refugees on the high seas and either repatriate them or transport them to hastily built camps at the U.S. naval base at Guantanamo Bay, Cuba--as Washington did in the early 1990s--are already drawing fire. While tensions have been building for months, last week's takeover by an anti-Aristide gang of Gonaives, the country's fourth largest city, has signaled a major escalation. The gang, which calls itself the Gonaives Resistance Front, was once loyal to the Haitian president but turned against him after the killing under mysterious circumstances of their leader last year. The takeover set off a widespread looting and burning of government offices throughout the city. When police tried to retake the city, they were beaten back in fighting in which at least nine people were killed, including seven police. The rebellion spread to St. Marc, another coastal town that has been a center of anti-Aristide sentiment, Sunday. The Associated Press reported that at least 18 people were killed in and around St. Marc and Gonaives in the last four days. With the growing violence disrupting what remains of economic life, American officials are worried that tens of thousands of famished people may take to the seas in rickety boats, much as they did under a military junta that ousted Aristide in 1991. Only the U.S. military intervention that restored the exiled former priest to power in 1994 stopped the exodus and persuaded many of those who had fled the country to return. The events of the weekend followed a meeting in Kingston, Jamaica, January 31 between Aristide and representatives of the Caribbean Community (CARICOM), which has been trying to mediate between Aristide and the opposition. Among other measures, Aristide agreed to disarm pro-government gangs who have attacked demonstrations by opposition forces, particularly students, in recent months; "reform" the police force; appoint a new prime minister acceptable to the political opposition; and call new legislative elections since the current parliament's mandate expired last month. But the opposition, which has rejected several past offers by Aristide to hold elections, has shown little if any willingness to negotiate with the president who returned to power in elections in 2000 that the opposition and some international observers believe were carried out unfairly. The opposition has insisted that Aristide first resign as president, two years before his term is set to expire, but Aristide has refused to do so. "I will leave here on February 7, 2006," Aristide said last week on his return from Jamaica. "People must respect that principle, one man, one vote." The Bush administration, which has made little secret of its distaste for Aristide, has called on all sides to forgo violence. Without endorsing the opposition's demands that Aristide step down, however, it has also called repeatedly for the Haitian president to undertake major economic and political reforms. In the absence of such measures, Washington, while continuing to supply humanitarian assistance, has withheld critical economic and development aid, and persuaded other donors to do much the same. Thus deprived of significant economic aid, the hemisphere's poorest nation has plunged into ever-greater misery. A recent report by the UN Food and Agriculture Organization found that 3.8 million people--roughly half Haiti's population--"are unable to secure their minimum food requirements." What economic reforms Aristide has carried out, largely at the behest of the International Monetary Fund (IMF), have actually added to his unpopularity, particularly among key sectors, such as public-sector workers and poor people hit hard by the reduction of subsidies for food and transportation, which had been his strongest constituencies. Disillusioned with Aristide, many of his past champions, including grassroots groups, labor unions, and professional associations have joined opposition, some of which includes forces that flourished during the Duvalier period and again during the military junta, including the mulatto economic elite. As a result, the opposition appears to agree on only one thing: Aristide must resign. Apart from that common denominator, anti-Aristide forces are deeply divided with some calling for the U.S. to intervene to ensure Aristide's departure, and others vowing to fight any such intervention. The stalemate, however, is clearly provoking both greater violence and growing immiseration for the vast majority of the country's poor - conditions that would appear to make far more likely a major exodus. According to Kathie Klarreich, a long-time, Miami-based Haiti observer, the State Department has contacted a dozen relief groups in the past month about possibly running a refugee camp with as many as 50,000 beds at the Guantanamo naval base. In the 1991-94 period of military rule in Haiti, the base housed nearly 70,000 Haitians who had been interdicted by the U.S. Coast Guard before reaching U.S. shores. Writing in the Christian Science Monitor, Klarreich noted that fewer than 1,500 Haitians were interdicted in 2003, but that the State Department are convinced that thousands could begin leaving even this month. A new interdiction effort, according to Klarreich, risks further embarrassing the United States, not only because it will demonstrate the persistent instability in nations that virtually border the U.S. at a time when the administration is pouring billions of dollars into Afghanistan and Iran, but also because of the obvious "double standard" it employs with respect to Haitian refugees. Current U.S. directives make it virtually impossible for Haitians fleeing the island to receive refugee status in the United States, and last April Attorney General John Ashcroft declared that Haitians posed a threat to national security because their homeland was used as a transit route for Islamist terrorists. The policy has been used to justify the indefinite detention of Haitians who somehow reach U.S. shores. People who may flee Haiti now, according to Klarreich, are fleeing "chaos created by unruly mobs, a politicized police force, and a resounding lack of leadership"--all of which should entitle them to refugee status. The preparations for a Guantanamo camp, however, suggest that the administration, which no doubt remembers the political costs to President Jimmy Carter of the 1980 Mariel exodus from Cuba, has no intention of granting that status to Haitians. CAMBRIDGE, MA, Feb. 9 - No rest at all for Haiti's Jean-Claude Jean-Baptiste (related photos and much more), a notorious criminal who played a prominent role in the brutal end of the Reverend Sylvio C. Claude - on September 30, 1991, in the city of Les Cayes. After murdering untold number of Haitians for his chief bandit boss Jean-Bertrand Aristide, Jean-Baptiste, Haiti's de facto security chief, is now in charge of three separate commandos, and the mission of each one of the terrorist groups is to murder the 184-opposition group leader Andre "Andy" Apaid, opposition leader Evans Paul "K-Plim," opposition senator Dany Toussaint and many others, I learned today from a credible source. PORT-AU-PRINCE, Haiti, Feb. 9 - Anti-government rebels had taken control of at least nine towns in western Haiti Monday, and the death toll in the violent uprising rose to at least 40, witnesses said - see related photo below. In the strongest challenge yet to the authority of President Jean-Bertrand Aristide, armed rebels began their assault Thursday in the Gonaives, Haiti's fourth-largest city, setting the police station on fire, driving police officers out of the town and sending government workers fleeing for safety. "We are in a situation of armed popular insurrection," said opposition politician and former army Col. Himler Rebu, who led a failed coup attempt against Lt. Gen. Prosper Avril in 1989. The deaths were reported by the Associated Press, Red Cross official Raoul Elysee, rebel leaders Wenter Etienne and Jean-Yves Marcisse, and Haitian radio. 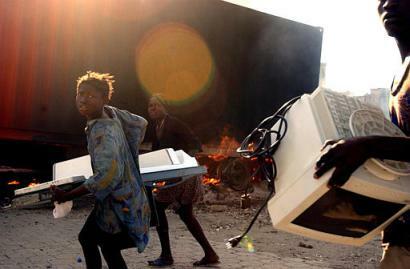 At the weekend, the rebels took the important port city of St. Marc, where hundreds of people looted TV sets, mattresses and sacks of flour from shipping containers. Using felled trees, burning tires and cars, residents blocked entry to several towns. Rebels blocking the road into St. Marc from Port-au-Prince, the capital 45 miles away, told Associated Press reporters Monday that if they entered the city there was no turning back to Port-au-Prince. They only would be allowed to travel deeper into rebel-held territory. The main rebel group is the Gonaives Resistance Front, formerly a gang of pro-Aristide toughs who terrorized government opponents but since have turned on the Haitian leader. In Gonaives, they were joined by some former soldiers of the disbanded Haitian army. The rebels are being supported by residents who have formed neighborhood groups disgruntled by mounting poverty, corruption and political crises. Anger has brewed in Haiti since Aristide's party won flawed legislative elections in 2000 and international donors blocked millions of dollars in aid. The opposition refuses to participate in new elections unless Aristide resigns; he insists on serving out the term that ends in 2006. Aristide was elected in Haiti's first democratic election in 1990 then ousted months later by the army. He was restored to power in a 1994 U.S. invasion. He disbanded the army and replaced it with a small civilian police force that is accused of being trigger-happy and partisan. In one the bloodiest clashes, 150 police tried to retake Gonaives on Saturday but left hours later after a series of gunbattles, witnesses said. At least nine people were killed, seven of them police. Crowds mutilated the corpses of three police officers, according to AP reporters. One body was dragged through the street as a man swung at it with a machete, and a woman cut off the officer's ear. Another policeman was lynched, and residents dropped large rocks on his body. Meanwhile, before dawn Sunday an unidentified group of arsonists torched a two-story building in northern Cap-Haitien city that housed the studio of Radio Vision 2000, destroying it, the independent Haitian broadcaster said. Rebels continued to rule the streets of Gonaives on Monday, witnesses said, though it was unclear how many armed militants were in the city of 200,000. St. Marc has a population of about 100,000. Calling the violence acts of terrorism, the government has vowed to regain control, but it was unclear when police planned to return. Premier Yvon Neptune, in a Sunday interview with state television, lashed out "The violence (which) is tied to a coup d'etat under way." ST. MARC, Haiti, Feb. 9 - Rebels blocked streets and hundreds of Haitians looted shops in this port town as an uprising raged in several communities against President Jean-Bertrand Aristide. Using felled trees, flaming tires and car chassis, residents blocked streets throughout St. Marc on Sunday, a day after militants drove out police in gunbattles that killed two people. Many residents have formed neighborhood groups to back insurgents in their push to expel the president. At least 18 people have been killed since armed opponents of Aristide began their assault Thursday, setting police stations on fire and driving officers from the northwestern city of Gonaives  Haiti's fourth-largest city  and several smaller nearby towns. Crowds mutilated and beat the corpses of three police officers. One body was dragged through the street as a man swung at it with a machete, and a woman cut off the officer's ear. Another policeman was lynched and stripped to his shorts, and residents dropped large rocks on his body. Haitian radio stations reported claims by other rebels that as many as 14 police were killed in Gonaives on Saturday, but that couldn't be confirmed. Before dawn Sunday, arsonists burned down a two-story building in northern Cap-Haitien housing the studio of Radio Vision 2000, the independent Haitian broadcaster said. Rebels continued to rule the streets of Gonaives on Sunday, witnesses said, though it was unclear how many armed militants were in the city of 200,000. Calling the violence acts of terrorism, the government has vowed to regain control of the area, but it was unclear when police planned to return. Police have deserted at least six other nearby towns, including Ennery, Gros Morne, L'Estere, Anse Rouge, Petite Riviere de l'Artibonite and Trou du Nord, according to the Haitian Press Network, a local news service. Attackers set fire to the police stations of Gonaives, St. Marc and Trou du Nord. One 22-year-old bystander in St. Marc, David Saint-Louis, was wounded by a gunshot in the chest Sunday and said it was a police officer  in civilian clothing but wearing a badge  who fired at him near a barricade. A number of people in both Gonaives and St. Marc said they formed neighborhood committees to aid the militants and keep watch over their areas. The recent violence started Thursday when members of the Gonaives Resistance Front, took control of the Gonaives police station during a five-hour gunbattle. They set fire to buildings  including the mayor's house  and freed more than 100 prisoners from the city jail. Those clashes left at least seven dead and 20 injured. PORT-AU-PRINCE, Haiti, Feb. 7 (Reuters) - Rebels said they killed 14 policemen on Saturday in a shootout with the authorities who tried to retake control of Haiti's fourth largest city from an anti-government group, the rebels told local radio stations. Journalists at the scene said the firefight erupted when a police caravan tried to enter Gonaives to take it back from an armed band that took control of the city on Friday and is demanding that embattled President Jean-Bertrand Aristide quit. Local radio reports quoted rebels as saying 14 policemen were killed in the fighting with members of the Front for Aristide's Departure in the port city about 105 miles from the capital, Port-au-Prince. It was not immediately possible to confirm the death toll, and there were no reports of rebel casualties. There were conflicting reports over which side controlled Gonaives. The crisis in Gonaives has come on top of months of sometimes violent demonstrations in Port-au-Prince and other cities in the impoverished Caribbean nation of 8 million people, mostly organized by Aristide opponents calling on him to quit. The president's political foes accuse him of corruption and mismanagement. But the former Roman Catholic priest, once widely hailed as a leader of the country's fledgling democracy, also now faces a serious threat from armed opponents. In the capital, Aristide told a crowd in the capital's slum of Cite Soleil that police were entering Gonaives to regain order, and said the government would "disarm the terrorists." Government spokesman Mario Dupuy said on local radio stations that the police were once again in control of Gonaives. But rebel spokesman Wynter Etienne told radio stations that his forces maintained control. Gunmen from the Front for Aristide's Departure stormed the Gonaives police station on Thursday and the Red Cross said at least seven people were killed in a shoot-out there. On Friday, the group, whose members number several hundred, burned down the mayor's home and released scores of prisoners. As police and the front exchanged fire in one part of town on Saturday, thousands of civilians demonstrated in another, calling for Aristide's departure, journalists on the scene said. Local radio stations reported that the streets of Gonaives were calm at midday and said civilians celebrated as police officers fled the city on foot. Members of the opposition front had barricaded the road out of the city with overturned vehicles, branches and boulders, according to witnesses. In Port-au-Prince, Aristide was celebrating the third anniversary of his return to power in 2001 after re-election with thousands of supporters, who then marched through the streets proclaiming their support for him. "This was democracy that we made. It's anarchy that they have made," said Rubens Sofor, one of the hundreds of Aristide supporters filing down winding streets toward the pro-government demonstration. Gonaives' front, formerly known as the Cannibal Army, had once been a militantly pro-Aristide group, notorious for its attacks on government critics. But after the murder last September of the gang's leader, which his family accused Aristide of ordering, the group turned violently against the president. Dozens of people have since been killed in violence between the front and the police in recent months. Gonaives, whose population was estimated at 200,000 before many residents fled the violence last fall, is commonly called the City of Independence, as it was where Haitian independence from France was declared in 1804. Aristide became Haiti's first democratically elected president in 1991 but was promptly ousted in a military coup. He was returned to Haiti by U.S.-led forces in 1994 and was re-elected in 2000. His once massive support has dwindled in recent years, but he has said he will serve out his term to 2006. PORT-AU-PRINCE, Feb. 6 (AFP) - Heavily-armed rebels' takeover of the Haitian city of Gonaives comes as a major psychological blow to embattled President Jean Bertrand Aristide, who is firmly resisting demands to stand down. "These are terrorist acts and the police will step in to reestablish order and protect the population. The terrorists must be neutralized," Communications Minister Mario Dupuy told AFP. Friday, members of the Revolutionary Artibonite Resistance Front (RARF), who are calling for the elected President Aristide to step down, criss-crossed the northwestern city on motorbikes and in cars. The group's name refers to a local river in the Americas' poorest nation. The RARF had tried to seize the Gonaives police station several times but had not succeeded until this week. The group torched and completely destroyed the building on Thursday. According to local media reports, residents in the city center fled Gonaives en masse when the rebels took control. Rebels also took control of an adjoining prison and released the 100 inmates being held there. The violence claimed four lives while another 20 people were injured, authorities said. Aristide's government acknowledged in a statement released over Haiti's official television network late Thursday that the opposition had seized the police station. "Gonaives is free. The stores can open, but the schools must remain closed," Winter Etienne, an RARF leader, said Thursday. The group's leaders said they were aiming to "free several other cities in the region." Gonaives, a coastal city, has been hit since last September with sporadic anti-Aristide violence, in which some 53 people have been killed and 119 have been wounded. The police station in the neighboring city of l'Estere, south of Gonaives, also was abandoned on Thursday, though members of the Front had not moved in, local media reported. Early Friday, rebels combed the neighborhood of Descahos, one of the last bastions of support for Aristide in Gonaives, to try to rout his supporters. Several homes of presumed Aristide supporters were set ablaze by members of the Front. Rebels also used iron bars to block a bridge north out of Gonaives. The symbolic significance of the fall of Gonaives is important in Haiti. It is there that Haiti's independence was proclaimed January 1, 1804, and there that, in 1985, the fight against Jean-Claude Duvalier began, leading to the fall of his dictatorship in February 1986. And it poses a logistical nightmare for the government. Gonaives supplies essential goods including gasoline (petrol) to the entire north of the Caribbean country, including Haiti's second city, Cap-Haitien. 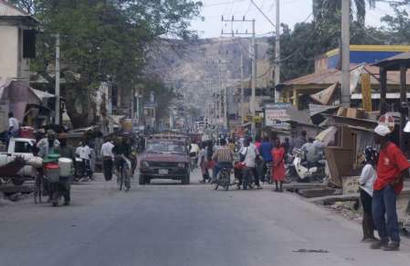 The rebels' takeover of Gonaives was already making itself felt in Cap-Haitien on Friday as power rationing kicked in. The fall of Gonaives also comes just as Caricom is scrambling to try to mediate in the Haitian crisis in search of some compromise settlement. Aristide in theory has accepted some of the Caricom mediators' suggestions including releasing jailed opponents, disarming pro-government irregular groups; and guaranteeing the opposition the freedom to demonstrate. If Aristide does not follow through, he will lose Caricom political support and potentially face sanctions, a diplomatic source stressed privately. PORT-AU-PRINCE, Feb. 5 -- Hopes for reaching a peaceful settlement to Haiti's simmering crisis appeared dashed Thursday after key opposition leaders said they would refuse to negotiate with President Jean-Bertrand Aristide. A mission from the Caribbean Community (CARICOM), headed by Bahamian Foreign Minister Fred Mitchell and CARICOM Assistant Secretary General Colin Granderson wound up a two-day mediating visit with Aristide and his foes miles apart. A majority of opposition members aren't willing to budge from their stance that Aristide resign, according to Haitians who met with the CARICOM delegates, while Aristide is insisting that he will serve the rest of his term, which runs until 2006. Leaders of the 15-nation CARICOM, which includes Haiti, have been shuttling between the two sides for several days now in search of some agreement to end the crisis and almost daily street protests that have killed some 50 people. CARICOM officials said Thursday they will nevertheless continue the mediation effort and will dispatch yet another delegation to Haiti in coming weeks. Kenneth Murray Cook, the Canadian ambassador to Haiti and a participant in the talks, said his country is ready to step in and back the CARICOM process but would not back sanctions -- an option raised by one CARICOM leader. Victor Benoit, a leading opposition member, said he was not optimistic about the CARICOM initiative because its leaders will soon realize that Aristide talks from both sides of his mouth. Aristide pledged to implement ''confidence-building'' measures following the Jamaica meeting. But he had promised the Organization of American States to take those same steps two years ago during the hemispheric body's lengthy initiative to bring political calm to Haiti. Today, many of the steps have not been implemented even though the framework for doing so still exists, said Luigi Einaudi, assistant secretary general of the OAS. Einaudi said the OAS' special mission in Haiti already has 25 technicians on the ground who monitor the situation, everything from security concerns to demonstrations to the police. But it needs more help if chaos is to be avoided, he added. ''The crisis in Haiti is extremely severe, and there is a real chance it will not be solved peacefully and democratically. We have been working on it for some time. We can use all the help we can get,'' he told The Herald. While CARICOM does not have the financial power to force a resolution to the impasse -- OAS officials estimate it will cost $70 million to $100 million to pay for the security and other measures needed to resolve the crisis -- it does bring to the table a political and moral authority that Caribbean leaders hope will go a long way for both the opposition and government. ''The important thing about the CARICOM initiative is that in the search for a solution, it directly involves a group of prime ministers who are experienced, tough political hands with long records of being able to rule their countries well and who have resisted the totalitarian temptation.'' Einaudi said. PORT-AU-PRINCE, Feb. 5 (AFP) - Four people were killed and at least 20 injured when armed anti-government militants torched a police station and staged a huge jailbreak in the Haitian town of Gonaives, opponents of the president said. "Four neighborhood civilians were killed in the shootout," Buteur Metayer, a leader with the Revolutionary Artibonite Resistance Front (RARF), told reporters. Another 20 people were shot and injured, he said, but there was no immediate official confirmation. Metayer's group seized the police station and freed the 100 prisoners believed to have been held in the adjacent jail earlier Thursday. They then torched the station and spread through city, later torching the home of Gonaives' mayor. "Gonaives is free, the stores can open but the schools must remain closed," said Winter Etienne, another RARF leader. At least 50 police officers were in the station at the time of the attack. Witnesses said they saw police officers emerging from the besieged police station with their hands in the air, while other officers fled. Metayer's group once allied itself with Haitian President Jean Bertrand Aristide, but quickly turned against the government after Metayer's brother, Amiot Metayer, was found shot and mutilated on September 22. The surviving brother has since declared himself the provincial police chief in Gonaives and named Etienne mayor. The RARF had tried to seize the Gonaives police station several times, but had not succeeded until Thursday. During the siege a police helicopter hovered over the station. Gonaives, a coastal city, has been the focus of sporadic anti-Aristide violence since last September, and some 50 people have since been shot dead and 100 wounded. On Wednesday, the president defiantly rejected calls for his resignation and promised to finish his term. "I will leave here on February 7, 2006," Aristide said. "People must respect that principle, one man, one vote." Aristide's opponents say he stole the 2000 election that returned him to power. International observers also said the polls were flawed, leaving the Caribbean nation locked in political crisis. The former Catholic priest was first elected president in 1990, but eight months after taking office he was overthrown in a bloody military coup. The United States sent 20,000 troops to Haiti in 1994 to bring Aristide back to power. He stepped down after his first five-year term, and was re-elected in 2000. Legislative elections were supposed to be held last year, but no electoral body was set up to oversee the polls, leaving the nation without a functioning legislature. Aristide now rules by decree, but has promised elections within six months. The opposition has rejected his proposal as inadequate. RELATED TOPICS aws bahamas caribbean community fire gasoline goPORT-AU-PRINCE, Haiti, Feb 04 -- Government supporters hurled rocks and bottles at student protesters in Haiti's capital Wednesday, prompting police to fire tear gas and warning shots, witnesses said. Some 100 students who were leaving after an anti-government protest picked up rocks that were hurled at them and threw them back, witnesses and Haitian radio reports said. No serious injuries were reported, but independent Radio Vision 2000 said police detained five students. The skirmish came as two Caribbean envoys - Bahamas Foreign Minister Fred Mitchell and Colin Granderson, assistant secretary-general of Caribbean Community - met privately for a second day with opposition leaders. The two planned separate talks with President Jean-Bertrand Aristide. Granderson said the 15-member Caribbean Community "will continue to engage with both sides." The students called their protest outside a courthouse in support of Luckmane Delille, a protest leader summoned to court to answer questions about violence last month during an anti-government march. "Justice for Luckmane!" the students chanted as he was being questioned inside. He has not been charged in relation to the Jan. 18 protest, when unidentified gunmen opened fire from a car and wounded one man, a bystander. The protesters then marched toward Haiti's national television station and were met by rock-throwing Aristide supporters. Moments later, unidentified attackers threw rocks at the television station, breaking windows. The government says those who attacked the building were opposition thugs, while opposition leaders say they were Aristide supporters. The government and opposition have been in a deadlock since 2000 legislative elections that observers said were flawed. The opposition has refused to participate in elections unless Aristide resigns, but he says he won't step down until his term ends in 2006. 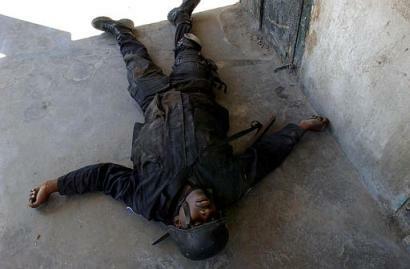 At least 51 people have been killed since mid-September in clashes between police, protesters and Aristide supporters. 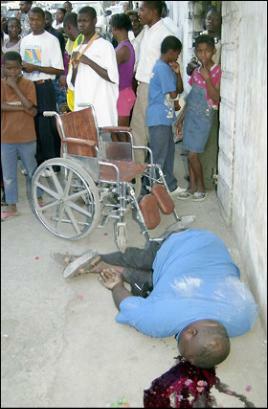 One handicapped beggar (photo below) who had participated in anti-government protests was killed in his wheelchair in a shooting in the Port-au-Prince suburb of Petionville on Tuesday. Government opponents said the killing appeared politically linked. But authorities have not established a motive. PORT-AU-PRINCE, Feb. 3 (AFP) - A teenager was shot dead by police during a protest as a Caribbean Community (Caricom) envoy arrived in Haiti seeking an end to the political violence that has torn the impoverished Caribbean state for weeks, press reports said. The youth was killed, and three others were wounded, during an anti-government protest in the northeastern city of Ouanaminthe, the reports said. In the capital Port-au-Prince, university students set up a barricade around a campus building and police responded by launching tear gas canisters. Bahamian Foreign Minister Frederick Mitchell arrived in Port-au-Prince as representative of the 15-nation Caricom, which has sought to mitigate Haiti's crisis. Opposition groups have been calling for President Jean-Bertrand Aristide's resignation in demonstrations that have often turned violent. Protesters have clashed with police and pro-government groups. Mitchell and Caricom's assistant secretary general, Colin Granderson of Trinidad and Tobago, were meeting Tuesday with opposition leaders. Mitchell was to meet with Aristide before leaving Haiti on Thursday. On Saturday, Aristide said a schedule will be drawn by March for the creation of a special advisory council comprised of political parties, religious organizations and human rights groups to help organize elections. Caricom had urged Aristide to accept the plan, which was proposed by Haitian church leaders. Aristide, a former Catholic priest who had served a five-year term in the 1990s, was re-elected in 2000 in elections observers deemed flawed. PORT-AU-PRINCE, Haiti, Feb. 1 (AP)--Tens of thousands of government opponents marched peacefully Sunday to call for Haitian President Jean-Bertrand Aristides resignation, a day after the embattled leader rescinded a police order restricting street protests. The demonstration began at a park in suburban Petionville and protesters walked almost 10 miles to the capital, protected by a contingent of police. "Were fed up with Aristide. Im marching to demand his resignation and to say we have to prepare his succession," said law student Paul Jean. The demonstration was organized by the Democratic Platform, a coalition of opposition political parties and civil society groups. A similar march brought out more than 15,000 protesters Tuesday, the same day police restricted demonstrations to a seaside square far from the palace. Aristide rescinded the police order Saturday, announcing the move at a one-day meeting with Caribbean leaders in Jamaica that addressed ways to end a three-year political impasse in Haiti. He also vowed to disarm politically affiliated gangs, reform the police force and implement other measures to end the countrys recent unrest. "Everybody has a right to demonstrate as long as everybody follows the law and works with the police in planning demonstrations," Aristide said at the airport late Saturday after returning from Jamaica. Police broke up three student demonstrations last week with tear gas, saying they werent complying with a 1987 decree requiring protesters to submit plans two days before and to give names of participants. Student leaders say they have respected the order. Few pro-government demonstrations have been disrupted, prompting criticism from rights groups who said Aristides government was trampling on a constitutional guarantee that protects freedom of assembly. The Americas poorest country has been in turmoil since Aristides Lavalas Family party swept 2000 legislative elections that observers said were flawed. Since September, at least 50 people have been killed and more than 100 wounded. The opposition says it will not hold talks with the government or participate in new elections unless Aristide resigns. Aristide has said he plans to serve out his term until 2006. KINGSTON, Jamaica, Feb. 1 - Haitian President Jean-Bertrand Aristide has vowed to disarm politically affiliated gangs, reform the police force and implement other measures to end the country's recent unrest. Aristide made the pledge late Saturday after meeting with the 15-member Caribbean Community, which put forth the measures that included allowing demonstrators to protest freely and releasing prisoners who have been detained since a Dec. 5 protest at Haiti's university. Aristide had outlawed street protests in the capital. The Haitian leader also promised to disarm gangs that have caused much of the violence in support of political parties. He also said he would reform Haiti's 5,000-member police force and work with the opposition to appoint a new prime minister. "You need good will on both sides," Aristide said following the one-day visit to Jamaica. "I believe my brothers in the opposition will come together for the benefit of our country." Jamaican Prime Minister P.J. Patterson said most of the reforms should be carried out within four to six weeks. He declined to outline consequences if Haiti doesn't comply, but said leaders haven't ruled out sanctions. Aristide also expressed support for a new governing council made up of members of his government, the opposition and civil society. Haiti has been in turmoil since Aristide's Lavalas Family party swept legislative elections in 2000 that observers said were flawed. Aristide has pledged to hold new elections, but the opposition coalition refuses to participate unless he steps down. Aristide says he will not step down until his term ends in 2006. At least 50 people have been killed since mid-September in clashes between protesters and police, and protesters and Aristide supporters. Bahamian Prime Minister Perry Christie said he hoped the new measures would encourage the opposition to negotiate. "We have to demonstrate a sufficient commitment for change in Haiti to achieve a level of credibility with the opposition," he said. The prime ministers of Trinidad and St. Lucia and observers from the United States, Canada and the Organization of American States also attended Saturday's talks.